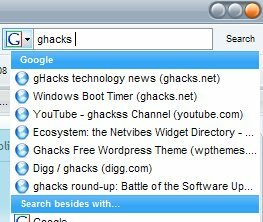 Awesome Search, which I reviewed two days ago, is probably the best application when it comes to Firefox extensions that display Google search results while you are still typing the search phrase. I would go that far that it saves a lot of space on the main Firefox toolbar because the search form on the right is superfluous unless you like to search on other search engines using that search form there. The extension is only available for Firefox 3 and the best Firefox 2 users can get at the moment is the extension Peers. Update: Peers has not been updated since 2011. It is not really required anymore as Firefox supports so-called Search Suggestions now that display search results as well while you are typing. Peers (which I discovered at Cybernet News) adds the same principle to the right search form. It displays the first seven Google or Yahoo search results beneath the entered search term in real time. A left-click loads the search result in the active tab while a middle-click opens it in a new one. The right-click menu is not accessible in the form unfortunately. The number of search results that are displayed can be changed from 0-10 which is the same range for search engines that are displayed beneath the results and the amount of search suggestions. The maximum is therefore 30 items divided equally among suggestions, search results, and search engines. The compact display has one disadvantage. If the websites that are returned in the results use long titles the url is not fully displayed. I always check the url before I click it which makes Peers for my purposes not that practical. The author should consider using two lines to display the contents or use additional horizontal space if that is possible. Peers is compatible with all recent versions of the Firefox web browser. I have been a regular here. I have read about Peers before from some other blog and have tried it. I feel its very very slow. Its not like normal Google search that provides instant auto suggestions. Even when I start to type the first letter, it hangs for a while and then allows me to enter the subsequent letters. I dont know whether did you experience this. Not as useful as I thought it would be, awesome search does it for me now and peers trims the titles so sometimes it doesn’t make sense. But I liked the inline search from the address bar in Firefox 3. That’s real time saver.